The work, though satisfying, is NEVER finished on a family farm. After our regular work days, Sean and I have chores, chores and more chores to do before we can settle for the night. I admit, some of those chores are self-inflicted. For example, Sean being given over 100 more tomato plants today at a local organic greenhouse who was getting rid of the stock they hadn't sold. These plants, currently living in Sean's car, needed to be replanted immediately if they were going to be of any use to us. So, the raised beds we just finished readying for peas and beans are now slated to hold tomatoes, instead. I appreciate the spirit of this gift, truly I do- I just worry about the flesh's ability to plant and tend these new acquisitions before we leave for vacation in 7 days. Tonight, we were eager to milk Ellie. Sean's lesson went very well yesterday and by the time he had settled into a rhythm, even Ellie seemed relieved with Sean's growing skill. We usually split chores between us to favor our individual strengths. For this chore, I collect and sanitize the equipment, prepare the iodine solution, and fetched Ellie's portion of grain. Sean took this time to loose Ellie (who bee-lined it for the milk stand) and then, washed his hands. I cleaned Ellie's udder. Sean milked. When he was finished, I took the collected milk into the house, strained it into sanitized one quart mason jars, and refrigerated them. Sean checked Ellie over and trimmed her hooves. He takes this time to brush her, perform any other routine care procedures and then, returns her to the pasture. I took the two+ quarts of milk collected yesterday and tonight and began making our first batch of cheese. Sean wanted to help with this, but he had tomatoes in need of some planting, so I got to play at this all on my own. I found a couple good, simple recipes and decided to combine two of them into my first foray. Since I did not have vegetable rennet on hand, I decided to use the recipes that call for vinegar or lemon juice to sour the milk. I opted for the lemon juice. 1. Very slowly bring the milk to 180 degrees in a good pot. (The best pot I have is the new one I just bought for milking into, so I used that this time. I shall have to invest in a good pot, though, for future!) I watched the pot very closely, stirred often, and used a candy thermometer to check the temperature. Remove from heat when the temperature reaches 180 degrees. 2. Add 1/4 cup of either fresh squeezed lemon juice or apple cider vinegar to the milk. Try not to knock over the measuring cup before you add either one. (I was in the process of squeezing my fresh lemon and accidentally tipped the measuring cup over, spilling a lot of it on the counter. I had some lemon juice in the refrigerator, so I added a few drops of it to make up the difference of what I lost.) Mix the lemon juice into the milk thoroughly and allow to simmer about 15 minutes until soft curds form. You need to stir this occasionally to prevent scorching. Remove from heat. 6. 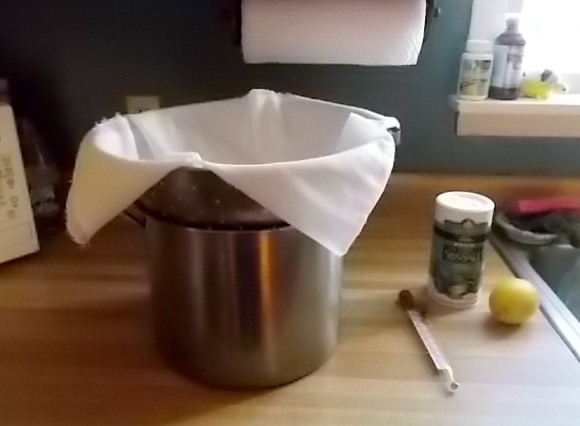 Tie the ends of the cheese cloth together and hang over a large bowl to strain the last of the whey from the curds for at least 2 hours, until the cheese is soft and pliable. 7. Add any spices you enjoy. We suggest chives, garlic, rosemary, and thyme. I was going to wait to update this post until this afternoon, but then, couldn't help myself. Besides, I am curious for any input you all have to what might be taking the curds so long to form??? I think that next time, I will follow the recipe which used vegetable rennet (instead of lemon juice or vinegar) as the active agent to see does that work better. I am anxious to go home to see what progress there is and thankful I have a job to be at today so I am not home staring daggers at that pot! Thanks to Country Girl from the Acorn farm blog, I may have saved my first attempt at cheese-making. 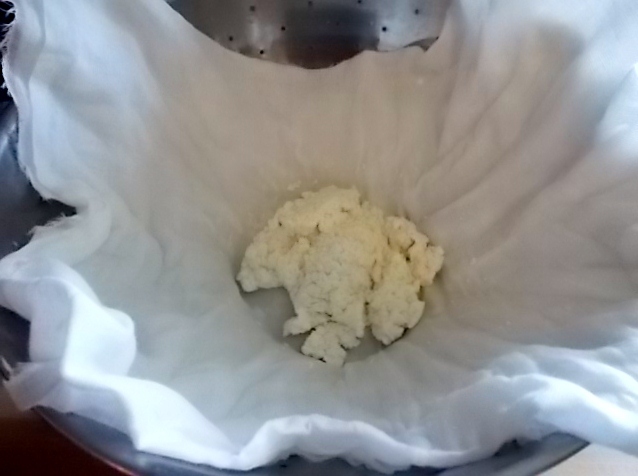 At the very least, the curds are separating from the whey. 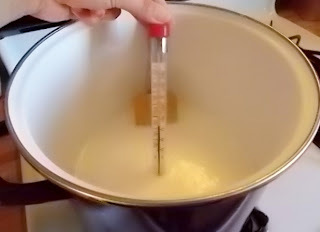 I read this post: making-goats-milk-cheese and saw that she kept her milk at 185 degrees for 15 minutes. I had not done that yesterday. The recipe I was following instructed me to immediately remove the milk from heat and add the curdling agent. Hmmm.... I figured, if it isn't going to hurt to leave the milk out and covered overnight to curdle, it couldn't be more detrimental to put it all back into a clean stock pot and heat the milk for a while, could it??? Within minutes of warming, a wonderful curdling effect started. I let it simmer for about 30 minutes, (I was hoping to get more curds by simmering longer, but I didn't.) stirring occasionally. Then, I poured the curd/liquid mixture into the 6 layers of cheese cloth lining my washed colander. 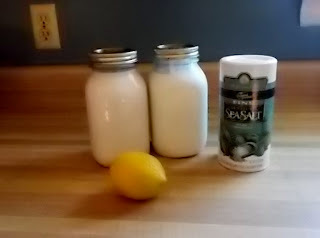 I added a pinch of coarse sea salt and left it to drain. It couldn't have been easier! The finished product. Once the cheese cooled sufficiently, I scooped the same amount into two pint canning jars. 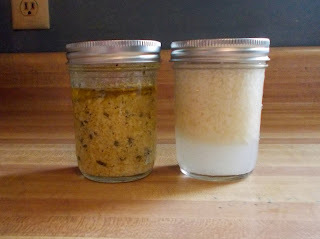 In the one to the left, I mixed in some fresh chive and garlic and poured some EVOO over it to preserve everything. 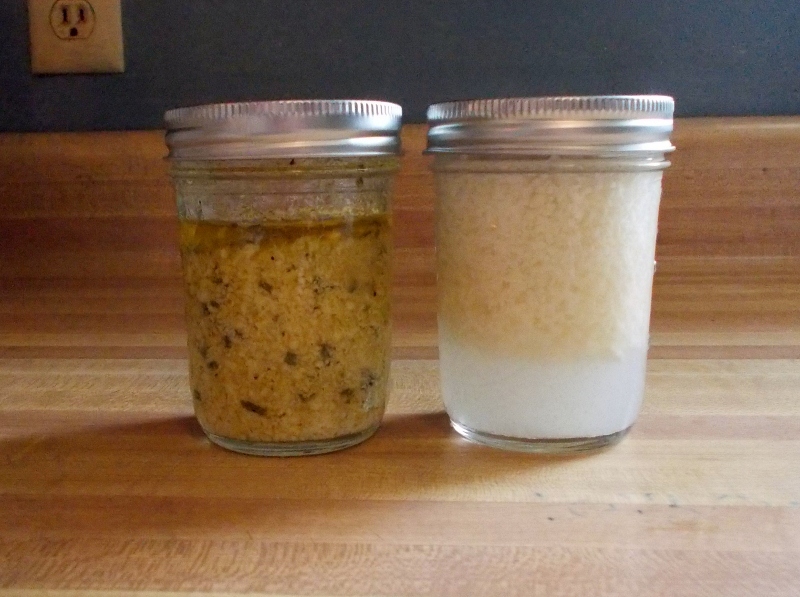 In the jar on the right, I dissolved some salt in water to create a brine and poured it over the cheese. I can't wait for Sean to come home from work to show him what I have been up to! First of all, I need someone to taste this creation to see if it is edible before I attempt to taste it. Secondly, no matter how it turns out, Sean is going to be so proud of me for doing more research and figuring the process out. Final note: Sean liked the finished product. I did not. It was edible, but not what I was hoping for. I suspect part of the problem was my technique (or lack thereof), having reboiled the milk, and the lack of finding a recipe that worked. (Next time, I am following Country Girl's instead and I hope for much better results.) What I intended to make was a nice soft, spreadable cheese for crackers, bread, and stuffing roasted peppers with. What I got was more granular and crumbly like a feta cheese, but very mild in flavor similar to a mozzarella. I will have enough milk to try again before the weekend. Try calling State of Maine Cheese Company in Rockport for input. We took the kids their a few years back for a field trip and they were very helpful. What pray tell is vegetable rennet? Can you pick it up at the store, or do you make it? Vegetable rennet is what you can use to cause curds to form in the milk if you don't want to use an animal based enzyme. I found this article on making my own. And, I have tons of nettles growing in the yard already! It was edible, I call that a success! I use a recipe like the one you used except with vinegar instead of lemon juice and it is yummy with crackers. Definitely tastes so much better than I thought it would lol. Lots of good luck with your next try.